One of my favourite community centres is the Centre Mario-Tremblay in the city of Alma, Quebec. To honour “The Bionic Blueberry” (or “Le bleuet bionic” as he was nicknamed in French) a life-sized lenticular poster of Tremblay was commissioned. If you’ve never heard of lenticular before, it’s a style of imagery that changes as you move. For the lenticular of Mario Tremblay, two images were used: the first is a picture of Mario back when he was 15-year-old, playing hockey for his hometown team, the Alma Aigles (Eagles). In the second, he’s a 19-year old, wearing his Montreal Canadiens’ uniform — the only team he played for in the 12 years of his professional playing career; the team where he won five Stanley Cups. The poster is a thoughtful tribute to a man who’s brought a great deal of pride to his community. It re-affirms his Alma roots which paved his way to his stardom as an NHL player. And the style of poster is a great way to honour players. You’ll find the details of how you can create a lenticular artwork below. Named after the town’s most successful professional hockey-playing son, Joseph Daniel Mario Tremblay (2/9/56) played right wing for the Canadiens from 1974 to 1986. Of his five Cup wins, he was credited with scoring the winning goal for one of them (and banking a second in the same game) to keep Don Cherry’s Boston Bruins from winning the 1978 Stanley Cup. When his playing career ended, Tremblay became a hockey commentator with opinions that weren’t always appreciated by the objects of his barbs. Four days into the 1996-97 season, he was lured from his media career — with no prior experience — to coach his former team. Even before the rookie coach stepped foot into the Montreal Forum, trouble had been brewing between him and his #1 goaltender, three-time Vezina Trophy winner and 1993 Stanley Cup winner, Patrick Jaques Roy. To this day, Canadiens fans still talk about what went on between Tremblay and Roy. The feud between the two Quebecois (and former roommates) — and the home game against the Detroit Red Wings is legendary. In fact, a clip from the commentary from that game is a highlight clip played daily on NHL Network Radio still. The long and the short of it is that Roy had an off day in goal and as each successive puck crossed the line, he became more and more humiliated. Tremblay didn’t take Roy out of the game before the Wings had chalked up 9 goals in the eventual 11-1 shallacking. As he left the ice, Roy said it was his last game with the Canadiens. True to his prediction, four days later Roy was traded to the Colorado Avalanche in what became known as the worst trade in the history of the Canadiens. Lyle Richardson called that entire season, “The Worst Year in Canadiens History“. Today, Tremblay is back on air, commentating for both radio and television in Quebec. He follows the trials and tribulations of the “Bleu, Blanc, Rouge” as they lace up their skates. Tremblay grew up playing hockey as an Aigle (Eagle) in Alma’s minor hockey system. From there, he spent two years playing for the Junior Canadiens in Montreal before his 100-point NHL debut in 1974. Nineteen seventy-four was also the year when the building that would one day be renamed “Centre Mario-Tremblay” first opened. Back then, it was a twin-pad facility with a gymnasium and swimming pool, attached to the local high school. It was originally called ‘The CREPS’, an acronym for the Regional Centre for Education and Sports. In 1990, it was renamed to honour Tremblay. 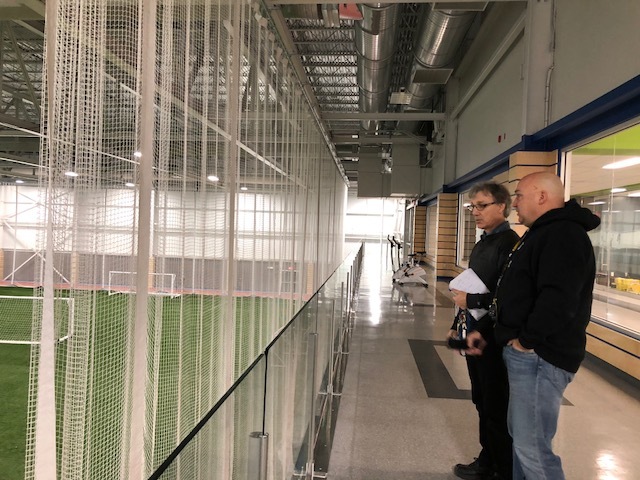 Roger Décoste, Buildings and Arenas coordinator, City of Alma (left) with a visitor overlooking the indoor soccer field. The facility has undergone several intense rounds of renovations in the past dozen years. In 2005, the ice plant was changed from CFC to ammonia and desiccant dehumidifiers were added to both rinks. The second round of renovations focused on harvesting the reclaim heat to be used as ambient heat throughout the massive building and high school. In 2016, an indoor soccer field and tennis/badminton courts were added, with a walking track circling both the field and the courts. The complex opens at 6 a.m. daily, and the parking lot is often packed, even outside of school hours. The massive complex is a true community center. Which is why I love it. Many of the cindercrete walls are painted in colours that help to mask any traces of hockey pucks or tape marks from sticks. They use a “gun metal gray” paint colour on some of the walls, contrasted and brightened up with Dodger blue on the walls opposite. Throughout most of the complex, the floor is tiled. The restrooms have a small splash of tiling that coordinate with the colour of the highlight paint used in the room. Everything you would expect has been thought of for efficiencies: the toilets have sensors, the sinks and showers have faucets that turn on and off automatically. The dryers are smartly placed next to the sinks, not on a wall next to the door where you sometimes walk into people as they come into the room, dripping water as you go. In the change rooms, hair dryers are placed high enough so you can easily dry your hair. What makes me really smile, however, is the life-sized poster of Mario Tremblay. As you climb the stairs to the arenas’ viewing areas and restaurant, you’re caught by the picture of the kid in a hockey stance and his bright, slightly nervous eyes. As you move by, the images changes as you go from the boy in the Eagles uniform and into the bright, confident eyes as the Canadiens star. The picture of Mario in his 1971 Eagles uniform was preserved by the Historical Society of Lac-St-Jean; the picture of Mario in his 1975 Canadien’s uniform was supplied by the Canadiens Hockey Club. The poster was designed by creative agency Saguenay Média from Saguenay, QC and produced by international lenticular printing specialists SOFTMOTION at their Montreal offices. Curious about the method — and the cost, I asked SoftMotion’s Project Director, Guy Brisson. For the Mario Tremblay project, the City of Alma had hockey-card sized replicas of the lenticular poster produced. I have two cards available: if you’d like one, send me an email and you might be a winner. The lenticular poster: it’s a brilliant way for municipalities, facility owners and architects looking for a meaningful way to honour a hometown hero.